I don’t want to spend so much time here because I know most of you know about the commandments given to Moses. You know the first 4 talk about loving god and not making idols in his likeness. For this the punishment is …5 You shall not worship them or serve them; for I, the Lord your God, am a jealous God, visiting the iniquity of the fathers on the children, on the third and the fourth generations of those who hate Me, 6 but showing loving kindness to thousands, to those who love Me and keep My commandments. This commandments were not meant for everyone, he is addressing the sons of Israel only. I have always meant to ask, if god created everyone, why does he show preference to one particular family? Who should the rest of the people worship? When he says you should not kill, it must be taken in the context that you should not kill an Israelite, but there is nothing wrong with killing a Canaanite heck you can kill anyone! God gets tired, I think those of you praying on Sundays don’t get answers since it his day of rest. But how do you know which was his 7th day? Why did he .. 20 Moses said to the people, “Do not be afraid; for God has come in order to test you, and in order that the fear of Him may remain with you, so that you may not sin.”? Don’t you think the outcome would have been obvious to him/it? What is this pettiness on how to make an altar and an obsession with barbecue? I’ve become increasingly frustrated with people’s insistence that words can mean whatever they want them to mean, and whatever is convenient for them to mean. Words are meant for one thing: communication. Once everyone personalizes words and definitions, we lose that ability. If “to you” a chair is what the rest of us consider a table, you’re going to lose us when you start telling about setting the chair for dinner. Even more frustrating is when people, or Bibles, make absolute claims about their deity. If you tell me your god is perfect, omnipotent, omnipresent, all-knowing, all-powerful, merciful, and all-loving, I fully expect him to live up to the literal implications of those words… and because you tell me they are absolutely true. If “God” is omnipresent, he is everywhere. Yes, everywhere. You cannot rationalize away the horror of Hell by claiming it’s merely the place where “God’s” present has vacated the premises. Yes, it’s hard to imagine than a merciful and all-loving god would create a place like Hell, so instead of facing the reality that he may not be those things, a new definition of omnipresent is constructed. Somehow “omnipresent” can actually exclude one very special place in the cosmos: Hell. God is everywhere… except there. But that’s not really omnipresent, is it? Apparently, to some, it is… but the word has lost its meaning altogether. If “God” is perfect, then his creation should be perfect… yes, even when given free-will. I think when we simply blurt out that everything “God” made is perfect, we forget what that implies. Humans would have perfectly understood that remaining in “God’s” grace would be the best choice; that “rebelling” would only hurt them. They would have perfectly trusted “God”, andperfectly behaved. Threats would have been unnecessary because they would have been able to perfectly think-through disobeying and the consequences. The only way our free-will would have tripped us up is if we did not have perfect understanding… and apparently, we didn’t. We hadn’t yet had a bite of the fruit of Tree of Knowledge of Good and Evil. So, without that essential knowledge, we were not “perfect”, and to insist we were–despite a clear lack of perfect motives, thought-processes, and critical thinking–undermines the meaning of the word. So, we’ve established that “God” is not literally everywhere, and did not literally create a perfect universe (because, even if people were the only thing wrong, that one blemish means the whole is not perfect). What other absolutes does “God” fail to live up to? Well, he’s not all-powerful. And do you know why? Because nothing can be all-powerful. There’s the so-called omnipotence paradox: “Could an omnipotent being create a stone so heavy that even he could not lift it?” Some Christians scoff at this paradox, but the reality is that it’s very telling. This is actually just one simple thing an allegedly all-powerful god cannot do, and that actually does invalidate the claim he can do anything he wants. He can’t. This paradox may sound silly and childish, but it’s true… and makes the idea of all-powerfulness silly and childish. And I’m sure we could think of many other paradoxes that “God” could not overcome. If even “God” cannot crawl into the definition of “all-powerful” or “omnipotent”, why use such useless words? It would serve theists much better if they just said that their god was “very powerful” or even “the most powerful”. But they don’t. Also, an all-knowing, all-loving, and merciful god would probably forgo creating humankind altogether, rather than insist that the bloody drama on this planet play out to the bitter end. If we’re now admitting “God” is not all-powerful, but trying to make the case that he’s at leastmerciful, the fact we exist at all speaks against that idea. Sometimes, we mercifully put suffering creatures out of their misery. If we knew their existence would only be one, long, unending sequence of horror (even with a couple good days), we might just decide not to bring them into existence at all. Even if you make the argument that there’s Heaven after death to look forward to, we all know not everyone makes it in (and so, we’re not really all loved, either). A god who knows our fate, but chooses to let us suffer through it, is not merciful or loving in any meaningful or remotely literal way. A merciful, loving god could not possibly know what might happen were he to create us. Just about every absolute claim made about “God”, absolutely fails. Why bother speaking in absolutes if there are so many damn exceptions, rationalizations, and excuses? The fact that there are so many apologist apologizing for the failings and failure of their god to clearly communicate, speaks volumes. Words have specific meaning so they can convey specific ideas. If your god does not live up to the literal definition of his supposed characteristics, stop singing his praises. You’ve been conned. My worldview does not suffer from glaring inconsistencies or contradictions. I do not need apologists to explain away flaws in my logic. If someone points out a real problem, I can alter my opinion to reflect reality rather than concocting elaborate dance routines to remain at my preformed conclusion. It’s not about insisting I’m right, but actually finding the truth. Sure, sometimes it’s elusive, but I want truth… and I need words to have meaning. Communication is important. If what you mean by “perfect” is not what I mean by “perfect”, we’ve failed. 21 Then the Lord spoke to Moses, “Go down, warn the people, so that they do not break through to the Lord to gaze, and many of them perish. 22 Also let the priests who come near to the Lord consecrate themselves, or else the Lord will break out against them.”23 Moses said to the Lord, “The people cannot come up to Mount Sinai, for You warned us, saying, ‘Set bounds about the mountain and consecrate it.’” 24 Then the Lord said to him, “Go down and come up again, you and Aaron with you; but do not let the priests and the people break through to come up to the Lord, or He will break forth upon them.” 25 So Moses went down to the people and told them. The prescription of touching the mountain. 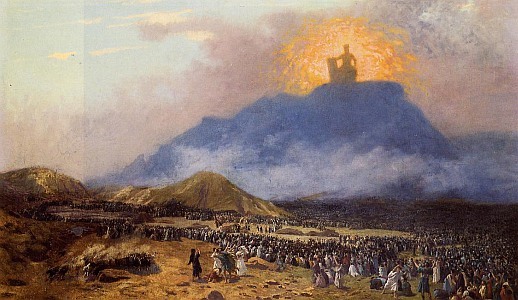 God on top of the mountain, the sons of Israel waiting on him. Jethro pays his son-in-law, Moses, a visit to offer fatherly advice. He brings along Moses’ wife and two sons. The boys have very interesting names, they must have been ridiculed by their peers. How do you name your son ‘I have been a sojourner in a foreign land‘ and ‘the god of my father was my help and delivered me from the sword of pharaoh‘. While we are still here, is the father in law also son of Israel? Moses narrates to the father in law the destruction and plunder they have done in Egypt and the two of them come to the conclusion their god is more powerful than other gods. This means, they were aware there were other gods and also they and their god were lacking in compassion and morals. How do you celebrate killing and plunder? Father in law wants to have the burden on his son reduced, he fears he [Moses] will burn out if he continues to work the way he has been doing. What passes me is how does father in law know he is over burdened, he just came to visit? He asks him to appoint judges over the people so he [Moses] remains an arbitrator in major disputes only to which he agrees and able men who fear god are appointed among the people to thousands, hundreds and tens. At this point only a few statutes if any have been issues, what statutes did father in law have in mind when he said Moses to teach the judges the matters of law. Moses, father in law, his wife and two sons. As your host, I think we have had a lot of religion going on here and today I want us to sit back and be entertained. If you have read The Brothers Karamozov, you will see the parallels in this movie and the trial of Mitya who is accused of killing the family patriarch. In the case of Mitya, the battle is fought between the lawyers and we see an outstanding performance first by the prosecutor and at that moment, even though it is evident to the reader he [Mitya] is innocent of the blood of his father. The defense lawyer makes a sterling performance and for a moment we think the jury is going to let Mitya free but they return a guilty verdict. Here, the movie starts with the judge giving the jury instructions telling them what duty they have in their hands and adds she does not envy their position. It is not my intention to spoil the fun for you. I hope you get time to watch and share your thoughts. At Auschwitz, in the Nazi death camps god is put on trial. The verdict.. In a hut in Auschwitz a group of Jewish prisoners pray to God to save them from the gas chambers. However others condemn God for abandoning them. The prisoners decide to have a trial to see if God broke his covenant to protect the Jewish people. This is the plotline of an engrossing film, God On Trial. The hour and half long film gives a balanced debate with both sides presenting good arguments. They are essentially grappling with the age old question, why does God allow bad things to happen?